You pay when the site is complete and live. EHR is a Nanny and babysitting agency. The site includes two extensive online registration forms and has generated a large amount of new business for the client. An e-commerce site featuring a powerful shopping cart with features custom designed for florists. 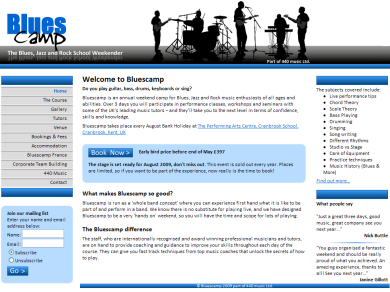 Bluescamp offer a residential rock school for musicians. The site details their services and facilities, provides an online booking form, subscription service, online promotional video and links to iTunes to purchase music. Simon Pinnell Associates is a boutique executive search firm specialising in finding talent for senior roles. The site profiles the business, provides a contact form and lists current vacancies. Simply Captured - Portrait Photography. Includes a gallery of the photographers work, plus contact details and pricing. A chain of 5 opticians, each with a customised website. The site offers visitors advice on eye care. Visitors with poor vision can resize the text using the 'A' button on the menu bar. Create a golf community with your golfing friends. Keep a record of your scores, calculate your handicap and share your match reports and photos. Bet on your matches with virtual money and keep an eye on your winnings compared to your friends. Howard Caine Conservatories have over 30 years experiense. This site profiles their business and includes a gallery of photos showing examples of their work. Angel Placements, nanny and household staff agency. This site contains online forms to register with the agency. A bright and colourful site designed to highlight the strengths of St Peters Primary and Nursery School.